Wednesday just gone was Gazin at the Café Royal with owner Nicolas de Bailliencourt and Laurent Navarre of Ets JP Moueix. We’d long been wanting to do a dinner to celebrate and highlight this sometimes under the radar Chateau. Gazin is brilliantly sited on the Plateau of Pomerol. The wines have always been well received but there seems to be a consensus that they have really “taken off” in the last decade. Without getting to specific about the the estate – Neal Martin’s book “Pomerol” does that well – it is planted with 90% Merlot, 7% Cabernet Sauvignon (relatively rare for Pomerol) and 3% Cabernet Franc. The 2012 and 2013 will interestingly be 100% Merlot as the near neighbour Petrus usually is. There is a second wine, Hospitalet de Gazin, which can be as much as 50% of the production. So onto the wines, we started before with a trio tasting of 2009, 2010 & 2011 before dinner. 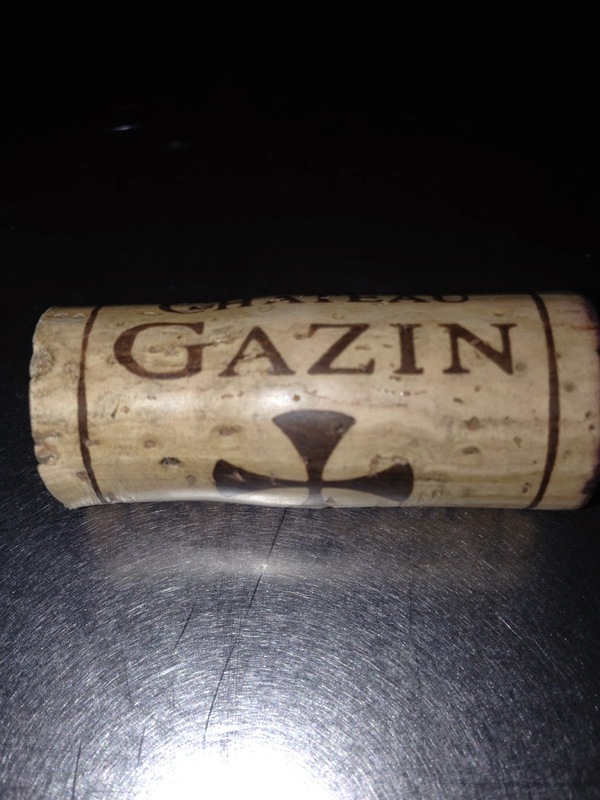 Gazin 2009 – Rich luscious, good concentration without being too much, has a very balanced palate that makes you want to drink it right now, there is a little spice there, red fruit comes though on the palate also. There is structure but the sweetness of the fruit keeps it quite hidden. If you own a fair bit then definitely worth having a bottle now otherwise I think the 10th birthday will see a delicious Pomerol that will drink for a long time. 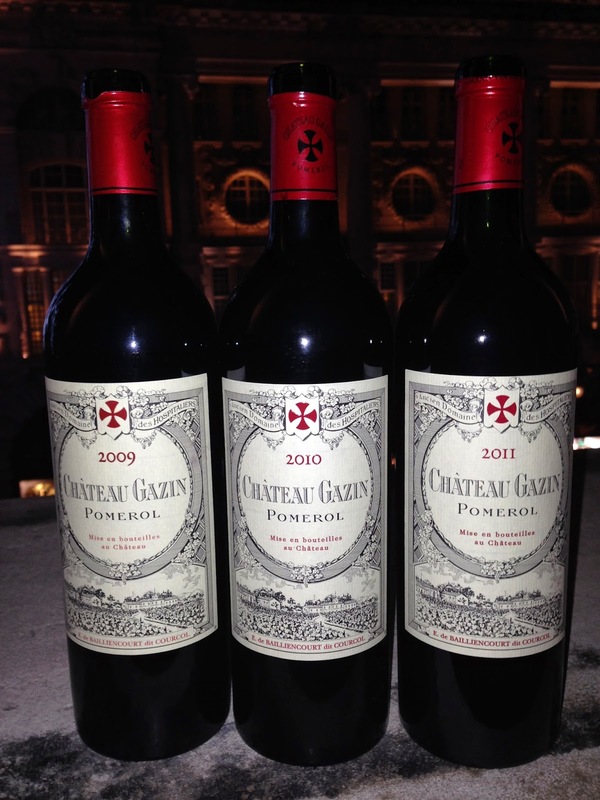 Gazin 2010 – More damson and black fruit, more acidity and more obvious tannin, grip but no harshness, more broodingly powerful, this will be a savoury and serious Pomerol, I would be waiting until the 12th or 15th birthday to start drinking this and then it will, like the 2009, drink for many decades. As with a lot of estates it will be very interesting to track the 2009 and 2010 alongside each other. Gazin 2011 – Red fruit and quite tight, the freshness is evident from the off then there is quite a bit of tannin that just needs to settle in to the wine, this will drink well in 3-4 years and then for quite a time. There was some similarity with the 1995 I thought, an almost feminine Pomerol, finesse over power. We then broke for a glass of Delamotte Blanc de Blancs NV which as always was drinking superbly, all precision but without being at all astringent. Lovely, must get a magnum for Christmas. With a first course of Denham estate venison Carpaccio, hibiscus and chocolate marshmallows we had the L’Hospitalet de Gazin 2009 & 2010. The first vintage that there was a second wine was the 1986. The 2009 was quite opulent and open with a mellow structure. The 2010 had blacker fruit and a more ferrous and iron-like density, probably best decanted if drunk now, delicious though and very proper with a touch of sweet fruit on the finish. The main course of Rump of English lamb, lardons, spinach with butternut squash puree and market vegetables was really very good indeed and matched the wines really well. 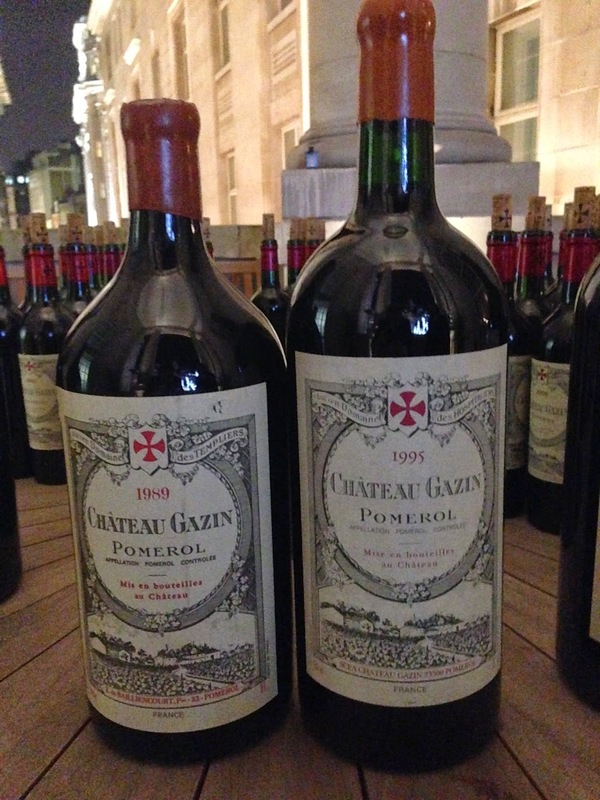 Both these two wines, the 1995 & 1989, were served from Double magnum. The 1995 was quite stringy and a little mean when I first opened it but 2 hours later it was delicious, delicate red fruit with a lovely saline refreshment this went down really very well on my table. 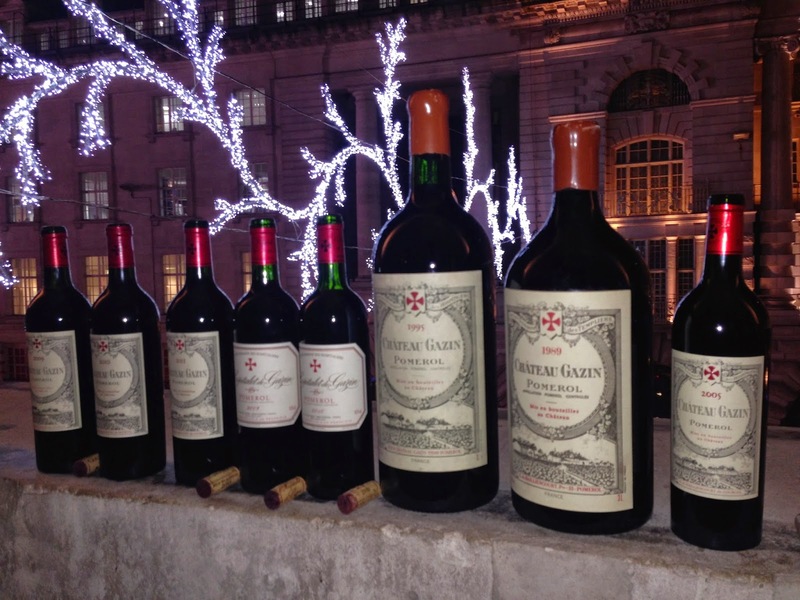 The 1989 was more variable across the three magnums. There is an exoticness to the wine that the vintage often displays, there is also more texture too, I like it but I am more excited by the 2005 onwards vintages, this coincides with the arrival of Mickael Obert as winemaker from Clos l’Eglise. The final course was Selection of hard cheeses with rye crackers we had Gazin 2005. I loved the 2009 & 2010 but if I was forced to name a wine of the night it would be the 2005. I thought it was delicious and not a waste to drink now much as I would leave it 2-3 more years before really tucking in with gusto. It had sweet fruit and just enough of a savoury edge to balance. A very complete wine that has a very bright future. So what was the lasting impression? This is a real wine drinkers estate. It is not showy or aiming to shock it is just very good indeed the wines have real balance and I anticipate the 2005, 2009 and 2010 all ageing in a very exciting fashion. In real terms it is out performing it perceived place in the Pomerol pecking order and that is exciting. Bravo Nicolas!